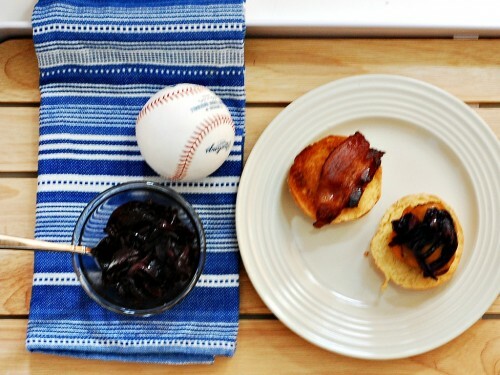 Sliders topped with cheddar, bacon, and onions caramelized in red wine are the perfect bite for your next tailgate! 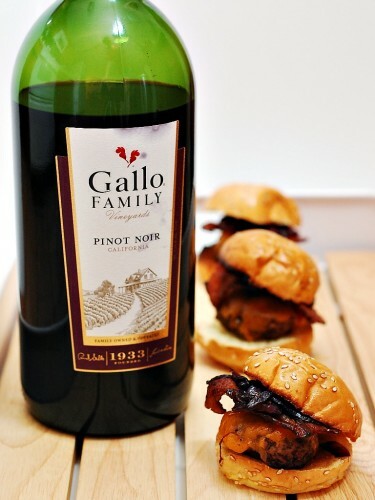 This week, #SundaySupper is teaming up with Gallo Family Vineyards to share our best tailgating recipes that can either include or be paired with any of the 9 varietals of Gallo Family Vineyards mini wine bottles. Though I’m not a football fan, Philadelphians (or is it just my family?) will find any excuse they can to tailgate – baseball games and concerts are the two big ones that come to mind. We’re waiting in line as soon as they open the gates, with our tents, a grill, and a TON of food. In my mind, tailgate food should be easy to eat with one hand (there aren’t always enough chairs to go around! ), easy to cook, and it should be delicious! These sliders definitely meet those criteria. The onions can be cooked up ahead of time and chilled. Come game day, put them in a foil pouch and throw them on the grill to heat them up again. The slider patties can be formed ahead of time and grilled at the tailgate. Heat the olive oil in a skillet over medium-low heat. Add the onions and rosemary and saute, stirring frequently, until softened but not browned, about 15 minutes. Add the wine to the onions, and cook until the wine is almost completely absorbed, about 10 minutes. Season the ground beef with salt and pepper, and add the Worcestershire sauce. Form into 12 patties, about 2.5 ounces each. Spray a skillet or a grill with non-stick spray, and cook sliders over medium-high heat for 4 to 6 minutes per side. Cut each slice of Cheddar into 4 squares. Put one square on each slider and cover skillet or close grill until cheese melts. Place on slider on each slider bun. Top with a half-slice of bacon, and some caramelized onions. Make sure to go visit Gallo to learn more about their wine and how well it pairs with tailgate food, as well as some great recipes. While you’re at it, make sure to check out Gallo’s convenient Store Locator and print a coupon for $1 off a bottle of Gallo wine! You had me at bacon! And then you just took it over the top with the onion and cheddar and Pinot Noir. Yum! Oh yum! You got me at bacon then the onion and cheddar makes it a triple taste bonus! 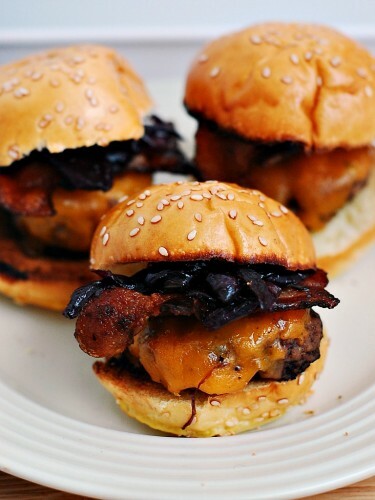 These sliders look perfect for homegating! These sound delicious, Coleen! Great tip for caramelizing the onions ahead of time and using a foil packet to reheat!! I could totally nibble on a few of these little guys! Anything with bacon on it is a love in our home! These are great for tailgating or any event! I’d eat these babies ALL.YEAR.ROUND! Wow, what scrumptious sliders! Yummy! Your sliders look perfect! I love, love, love all of the flavors you have going on in it! Perfect for tailgating! Pass me two burgers and a mini bottle. Total yum! These look and sound fantastic!! Great tailgate nibble!! Ahh, a fellow Philadelphia fan 🙂 These sliders are perfect tailgating food! I absolutely love caramelized onions on my cheeseburger and then to add in the bacon? I’m hooked! I am with you – handheld bites are such good fare for tailgating! Love all of the flavors you have packed into yours! You are so right about Philadelphians. We are the best and the worst sports fans at the same time and always look for an excuse to eat good food and drink delicious drinks! Good food, like these sliders! I love what you did with the onions. So tasty! WOW these sliders look incredible! Definitely could devour a couple right now.. bacon, onion and cheddar cheese is a match made in heaven! Those red wine onions sound delicious. These look easy enough to put down a few! This sliders would slide off the plate quickly and be gone with both family and guests. Delicious.